For over 30 years, The Pins Penches welcome lovers of taste and pleasure for gourmet moments of exception in a gorgeous setting. A meal in our walls is a real experience. It is first an invitation to discover our local terroir that chef Stéphane Lelievre and his team sublimate daily in cooperation with our local producers. The incentive to travel is increased by the alleys of the park, where century old pine umbrellas alongside one of the largest palm groves in Europe grow. It is finally an invitation to relax in one of our living rooms facing the fireplace, in the canopy or on one of ourterraces facing the sea. In short, more than a restaurant, The Pins Penches is truly a timeless experience. The professionalism of the service rivals that of the kitchen team and the exceptional setting. A unique blend moment that turns your experience into a magical moment. In all seasons, our indoor and outdoor lounges are places for relaxation before or after your visit to the table. For the cooler season , close to our dining rooms , relax in a comfortable chair by the fire or in our large garden canopy winter window overlooking our wine cellar. In summer ( July & August ) , in the evening , enjoy your drinks in our , with lounge overlooking the palm grove, magnificent views of the Mediterranean Sea and the sunset. 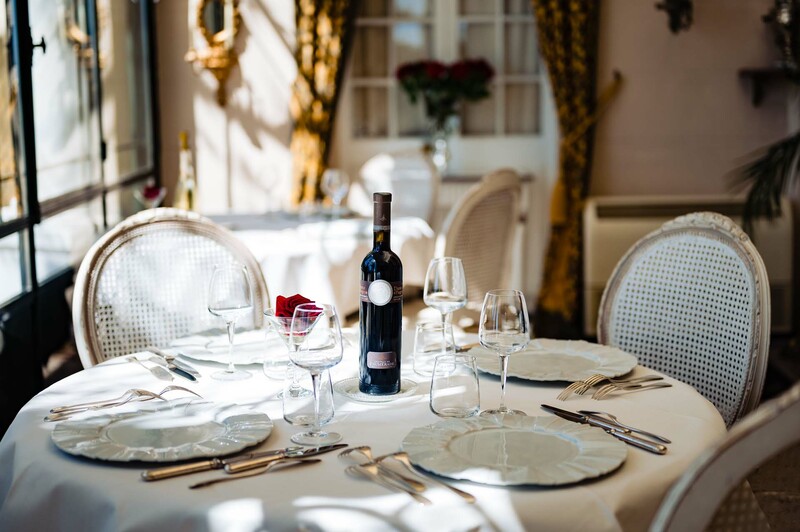 EFlipping through our wine list , you'll find a selection of the greatest French vintages..
Long tasting sessions were held to select those bottles , sometimes known , sometimes unexpected. We present the best , in our opinion , to accompany your meal. These bottles are the fruit of men and women's hard work, often families , passionate and exciting , to which we pay tribute to the gustatory pleasure and quality of products they provide us. In total, a few thousand bottles resting in our cellar situated in the winter garden under the glass roof of the bar.. You can admire the few thousand wonderful bottles while awaiting your choice , we will strive to make it as easy as possible to select the wine which is right for you. Do you enjoy our wine list ? Take home your favorite discoveries from the Pins Penchés ! Do you have a question ? A particular request ? Need information ? Do not hesitate to contact us by this form we will answer as quickly as possible.